The Earliad: Which Super-Villain Could I Defeat? Like many men who grew up reading comic books, I've often imagined myself as a super-hero of one type or another; indeed, back in my teens and early twenties I actually created my own characters for the Villains & Vigilantes and DC Heroes roleplaying games. But in a scenario such as the one I imagined yesterday, in which normal, middle-aged me was suddenly thrust unprepared into a comic-book universe, I'd probably be pretty useless in any superhero slugfest - unless I was fighting one of a handful of particularly inept villains. 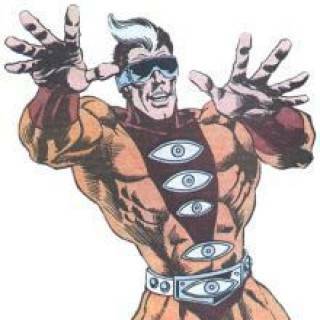 1) The Ten-Eyed Man. A cat burglar with an eyeball at the end of each fingertip, the Ten-Eyed Man appears, at first glance (heh), to be fairly formidable, given his physique. But good guys don't necessarily have to be sportsmanlike, and I figure I could drive the Ten-Eyed Man off simply by opening a bottle of vinegar and splashing it all over his fingers. Ouch! 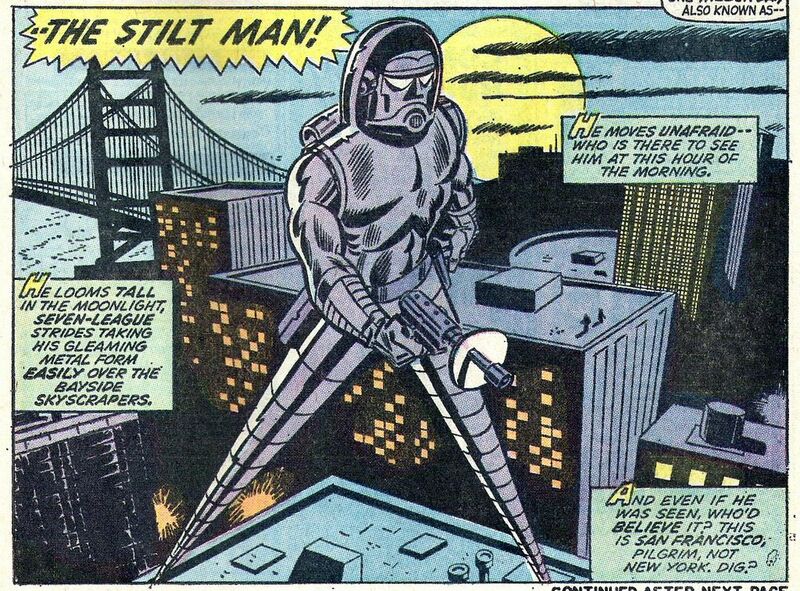 2) Stilt Man. This guy looks pretty intimidating, but if I saw him coming and had a length of chain or cable, I'd just wrap one end around a fire hydrant, run across the street, wrap the other end around a telephone pole, and boom, Stilt Man goes down harder than an Imperial Walker after Dack wraps it up with a tow cable. I suppose I could also just ram my car into his feet to bring him down. 3) Clock King. Clock King is just an ordinary guy in a ridiculous costume; he's also very particular about timekeeping, to the point of near-insanity. While I hate to take advantage of anyone's obsessive compulsive disorder, I'm pretty sure I could distract Clock King by setting a small collection of clocks and watches to different times and tossing them at his feet. While he knelt to fix the errant timepieces, I'd grab the watch hands on his mask and rip them off, robbing him of his ability to display the correct time at all times. I'm pretty sure this would send him screaming back to his hideout to fix his mask, putting an end to whatever crime he had planned for that day. 4) Kite Man. 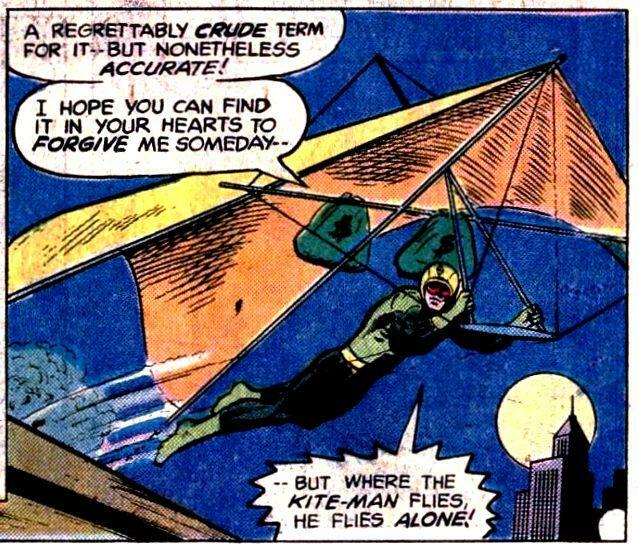 Kite Man is an expert hang glider - and that's it. A little vandalism would put an end to his schemes; I can't think of anything easier to put out of commission than a hang glider. Even if he were in the air, I could probably bring him down with a spear gun from the nearest sporting goods store; you have to fly at pretty low altitude to commit crimes (unless he were robbing a blimp or something), so putting a couple of spears into the canopy would do the trick. Mind you, I'd probably be pretty squeamish about this; I'd be worried about actually hurting him, either due to causing a crash or accidentally spearing him. Hey, property crimes aren't worth the ultimate punishment, right? The Riddler. But to be fair, he would do at least half the work for you. Well, supervillains are super by definition, and so should not be met and bested by rank and file citizens like us. Even so, if I had to pick, I'd say Riddler as well. I'd pay good money to see you beat the Jim Carrey version with an office chair. But I think there's a strong argument for The Joker as well. Honestly, you wouldn't last five seconds against Big J, come on, even Batman and Superman together can't beat him. Hear me out: I believe you could quite easily take out Joker's Art Director, though, which would then cripple the Joker into total defeat. There are a number of Jokers. The Heath Ledger Joker is likely the most minimal, if that means anything. Still, even his Joker depends on custom-made cards, costumes, and all manner of props. The Arkham series of games has the Joker living in massive Joker-themed lairs, complete with sculptures, lighting, and novel architecture. Certainly The Joker by himself would be unable to accomplish all of that. All you would have to do is canvas (pun) the Gotham art supply stores and see who was buying all the green and purple paint. You go to that house and when they open the door to accept delivery of 10,000 wind-up chattering teeth, you hit that person right in the face. With Joker's Art Director out of the way and when Joker's props and colouring supplies dwindle, he's going to be reduced to being just another goon on the street, easy pickings for the Gotham Police. You would get the key to the city! Batman would go out of business. A bored Bruce Wayne would have you over to play tennis on weekends. Vicki Vale would have your name in her little black book. It would be much harder on you being the celebrated hero of Gotham than what it would take to defeat the Joker for once and for all: art supply denial. Wow, I'm flattered that anyone thinks I stood the slightest chance against high-level members of Batman's rogues gallery, but when presented in the light above, I suppose it's just barely possible. I sure hope I never have to make the effort, though! Thinking more, there ought to be a number of villains from the Tick universe you could beat. And Dave Bautista. I know you can beat him. There's a trick, though. If Dave Bautista doesn't have any friends in the movie he's in, he dies. If Dave Bautista does have friends (as opposed to co-workers or employers, which don't count), he's invulnerable. So you have to post nasty things about Dave Bautista in social media so that his friends all leave him. Then you can take him down, although it still won't be easy. Let me know when you'll get going on this, I'll pop some popcorn.